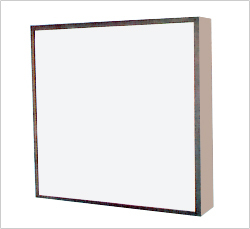 As HEPA filters, these filters are also made out of imported micro glass fibre paper. The filter pack is manufactured by pleating a continuous media roll using automatic media pleating machine. Non dissolving thread glue is applied continuously while pleating at equidistances. The thread glue here act as separators, which in turn provide uniform spacing between the media folds as well as rigidtity and strength to the media pack. The filter pack prepared is then permanently bonded to the casing. The type of casing usually available are Aluminium anodized / powder coated, Galvanized iron powder coated or stainless steel. These filters are best alternative to the conventional HEPA filters, with Aluminium Corrugated separators. It can handle more volume of air, as more filtration area is available to the same size of standard HEPAfiiter. It is easy to handle while fixing / removing, as weight of the filter is less. Filters with 4 inch thickness also available on request for higher air flow rates. Initial Pr.drop: 15 mm wg (Max). Final Pr. drop: 60 mm wg. Testing Method : EN 1822, FED 209 E, with Drop Solution.